Veganuary is a charity that encourages people across the world to experience vegan living for the month of January, a time of new challenges and new beginnings! This UK-based online vegan campaign, launched in January 2014 after a conversation between husband and wife co-founders, Matthew Glover and Jane Land in late 2013. In 2017, Veganuary began actively promoting its vegan pledge as a year-round online campaign, although the program’s focus is primarily on the month of January. Participants receive daily email support and are encouraged to engage actively with Veganuary on its social media platforms. Veganuary.com is the largest website of its kind, providing all the answers to “why go vegan” alongside excellent guidance on “how to go” vegan. The website features more than 500 vegan recipes, a vegan guide to eating out, and an online vegan starter kit, alongside the latest news and expert advice. Veganuary 2018 broke all records (see 2019 update) — almost 170,000 people worldwide pledged to try vegan for the month of January! The campaign has continued to build in strength since its inception. Sign-ups increase every year, and the program has attracted national media coverage ranging from major newspaper coverage to radio and television appearances. It’s official — the world has embraced “Veganuary”! 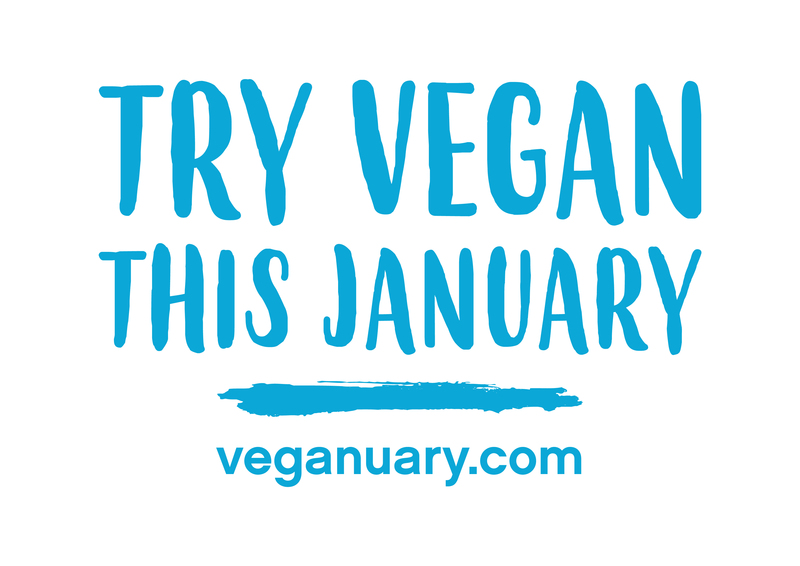 Veganuary is a charity inspiring people to try vegan for January (“Try Vegan This January” campaign) or for any other month of the year (“Try Vegan This Month” campaign). Dedicated to changing public attitudes towards vegan living while providing all of the information and practical support required to make the transition to veganism as easy and enjoyable as possible. Veganuary is a free 31-day online vegan-pledge challenge. Once signed up, participants receive daily email support and are encouraged to actively engage with Veganuary on its social media platforms, including the Facebook group where participants old and new share their experiences and offer each other support. The group is continuously growing and now has approximately 20,000 members, consisting of both past and current Veganuary participants and seasoned vegans and vegan advocates. The campaign’s content spans the three main areas of motivation for exploring a vegan lifestyle: for the animals, for the environment, and for personal health; and it focuses on targeting the key demographic: female millennials (15–35 years of age). Advertising the pledge is carried out primarily online via social media and Facebook ads. An annual public transport campaign paid for through crowdfunding lends additional publicity. 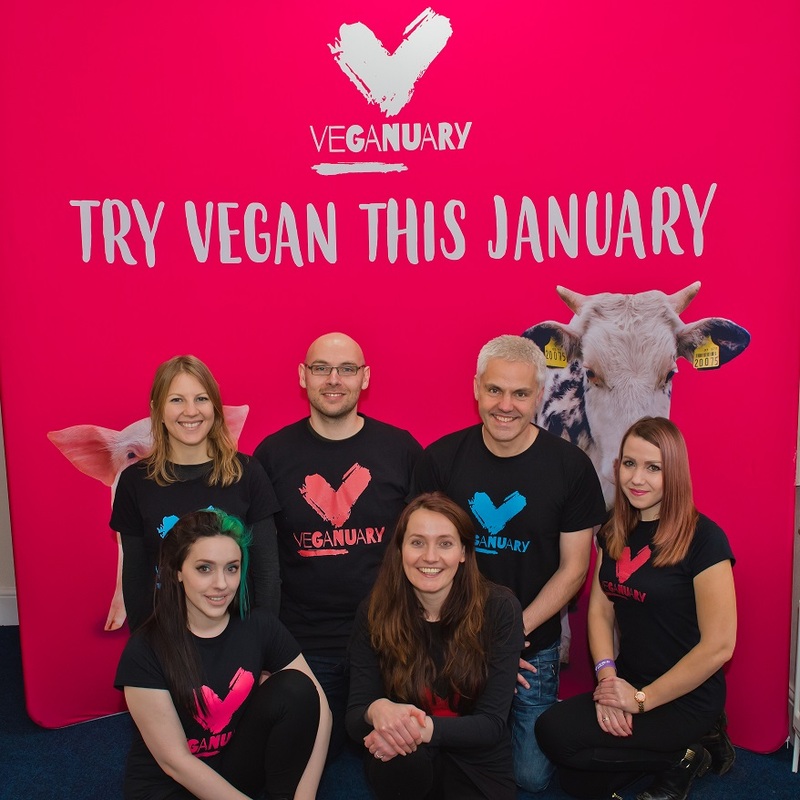 Organizers hold an annual press launch and build ongoing relationships with companies and brands to help get Veganuary reach a broad audience. Activities include sponsorship from popular vegan brands, chain restaurants launching ‘Veganuary specials’ (and even full menus! ), vegan recipe videos, celebrity vegan ambassadors endorsing the campaign as official Veganuary, and more. Right across the world, people are recognizing that each of us can truly make a difference to our health, to animals and to the environment, and we can do it easily — and tastily — three times a day. Small changes that we make have a huge collective impact, and for the two-thirds of our participants who reported health benefits in just four weeks, there is another incentive to remain vegan. Veganuary has grown in popularity every year, and Veganuary 2018 broke all records! Check out the full Veganuary 2019 survey results! *Data includes only those respondents who were not vegan before Veganuary. 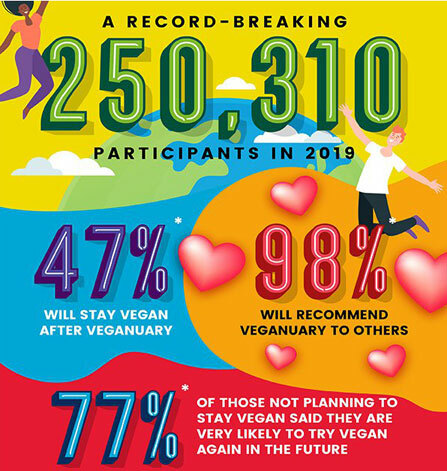 Results based on a survey sent to 69% of Veganuary 2019 participants, with an 11% response rate. The practical daily aspects involved with vegan living can be a barrier for some people. Veganuary focuses heavily on the practical "how to go vegan" element and provides information to help break down that barrier. From daily email support and a Veganuary Facebook Community to free access to more than 500 vegan recipes and an online vegan starter kit, these tools and resources assist people in making changes in a way that supports the obstacles they face in their day-to-day lives. 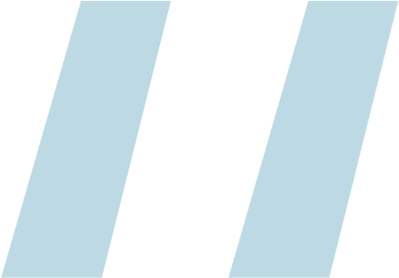 Ready to apply for an Online Campaign grant?